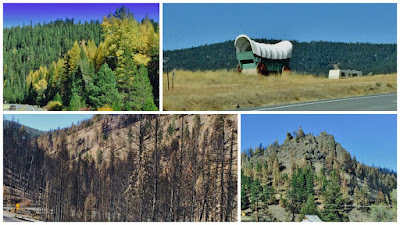 The drive to Burns, OR on October 8th, took us through a few mountain ranges, some of the highest we have been in with the RV, she did pretty well climbing them. After pretending we were the Energizer Bunny for a couple of weeks, we needed a break. Cranes Hot Springs RV Park was the place to do it. 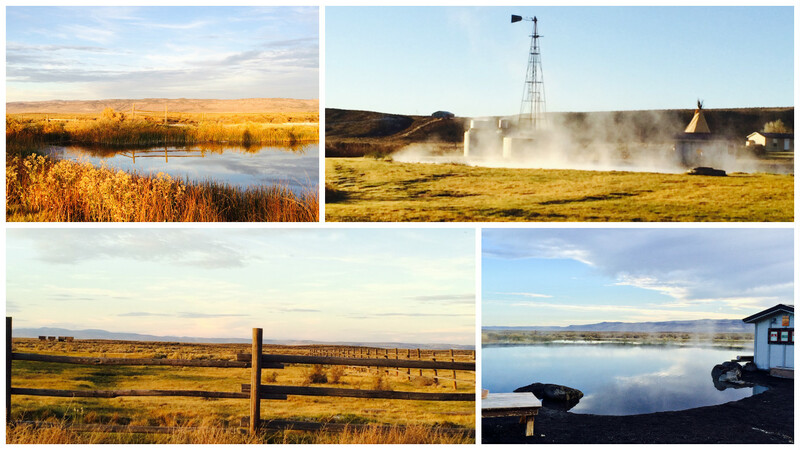 It is truly in the middle of nowhere, extremely quiet and they have a wonderful hot spring to soak in. The park is a combination of campsites and cabins. 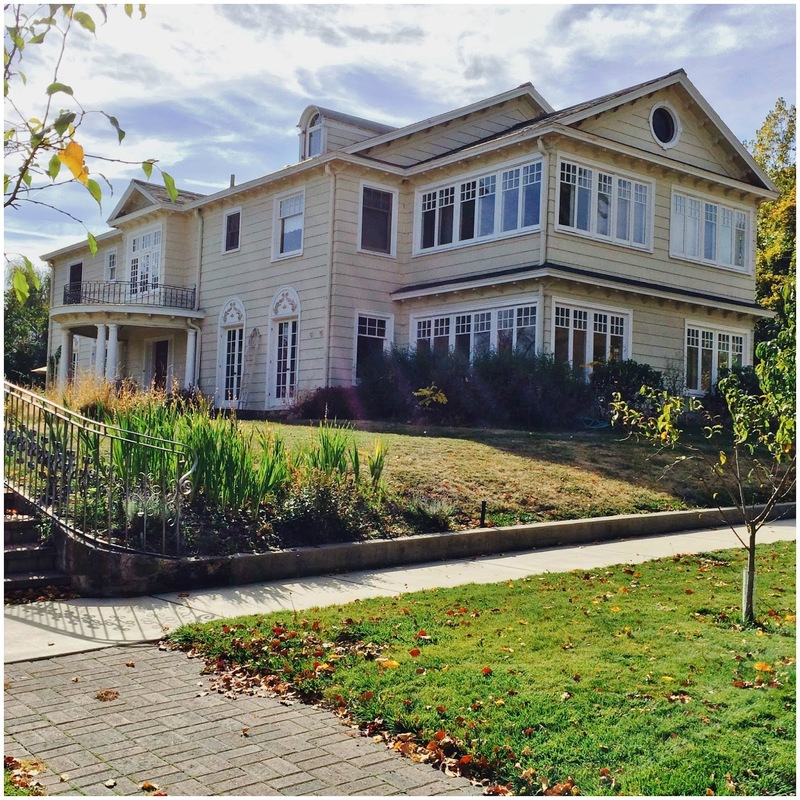 They have a beautiful rec-room with large comfy couches, a big screen TV, a fireplace and some video games. They offer coffee and cookies every morning, plus there is a camp kitchen, for those staying in the cabins. We spent our time wisely here, sleeping in and enjoying the hot spring, as well as amazing starry nights. The sites are all gravel but there are a number of grassy spots to walk the dog. 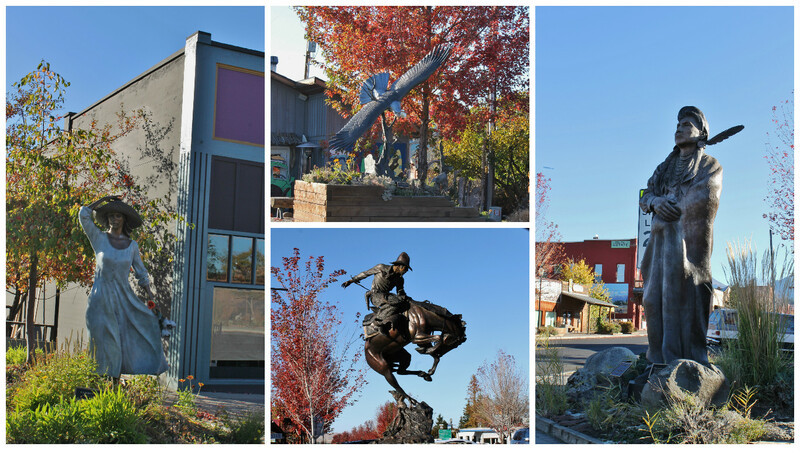 Burns is about 20 minutes away, small town but some cute stores to enjoy. One was a quilting store and it made Nancy very happy to wander through and touch all the fabric, which gave the ladies in there quite the chuckle. The Burns party stores offer growler fill stations, this one had a sangria along with the craft beer, plus you can sample them all. Nancy was excited to get her howler (half growler) filled. They also have a VA clinic that has the most reasonable people we have met in the VA system yet. Our last day here we experienced our first dust storm, the park is surround by high desert prairies full of sagebrush. This was a mild storm, we do not want to see a bad one. At one point the dust blocked out the mountain ridge. Our RV was full of dirt, as we write this blog a few weeks later and a number of cleanings, we are still finding dirt. 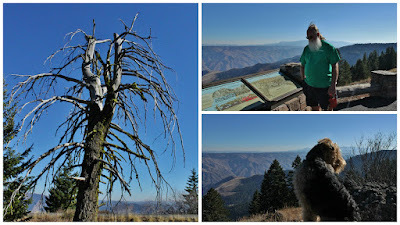 La Grande, OR was a 5 hour drive from Burns, but put us in the Hell's Canyon area. 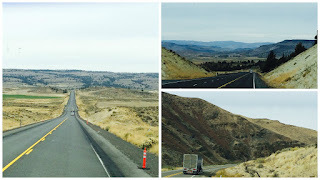 We drove the John Day Hwy, which is a beautiful road. Unfortunately, one section experienced a fire in the spring and many people lost their homes. We stayed at the Eagles Hot Lake RV Park, which is between Union and La Grande. There is close to 100 sites, all pretty decent sized, we had an end spot so it was double the size of the others. 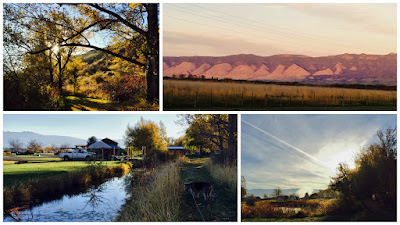 Very few trees but surround by mountain ranges.There is a creek that runs through the grounds and lots of large grassy areas for dog walking. Unfortunately, there is not a hot spring on site, some close by but the cost of $25 an hour to use them is a little steep for us. There is a heated pool and a hot tub on site, the laundry room and bathrooms are very clean. There is a railroad not far from the park but no road crossings so the noise in minimal. Lots of coyotes can be heard at night and seeing we are here during hunting season lots of gun shots during the day and way to much dog barking from the hunting dogs staying on site. Hell's Canyon was fun to explore, the drive to and from was just as pretty as the canyon. 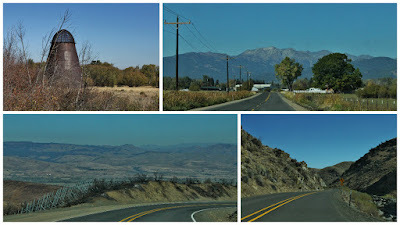 The road was full of twists and turns and great mountain views. We have seen a few of these cool silos, or at least that's what we think they are. We stopped at two overlooks for Hell's Canyon. Nice views and a good place to stretch our legs and Mielikki's too. 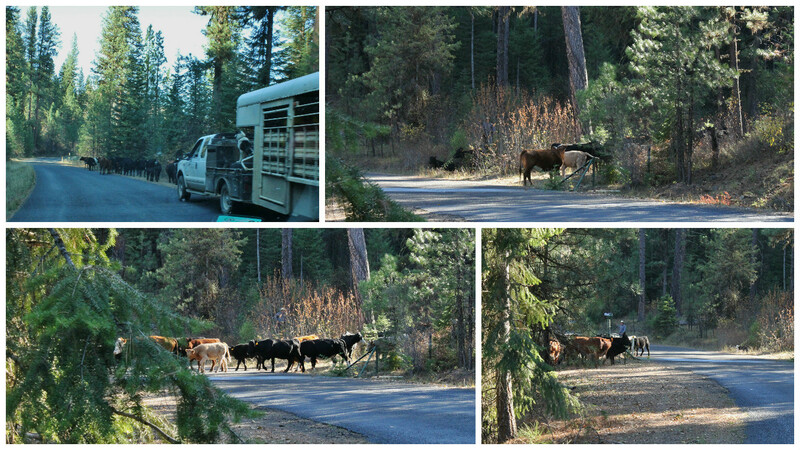 Just out side of the park we came across a rancher moving a herd of cows. 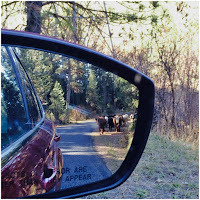 The cows were walking on the side of the road with the rancher driving his truck behind them. 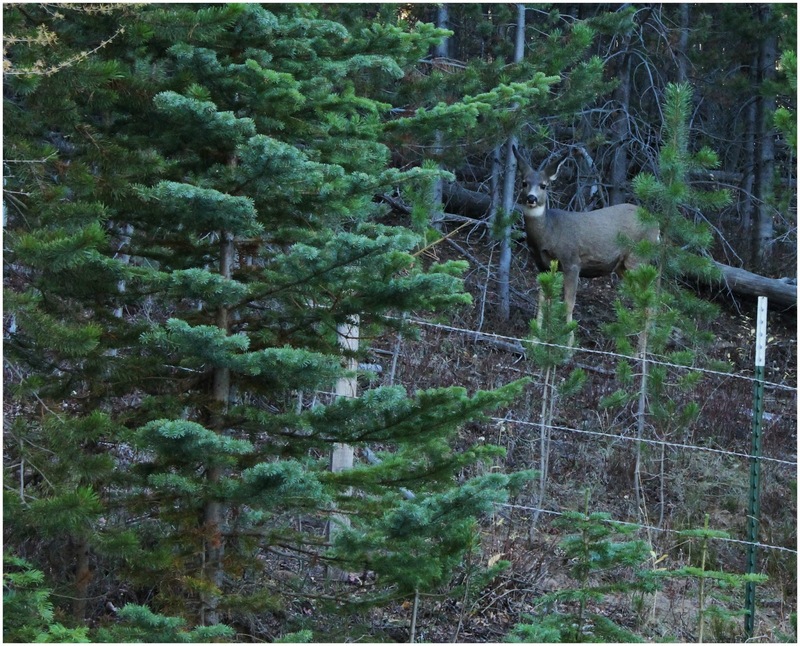 They came to a section of the road that had the metal bars to keep animals from crossing there. We stopped to watch how he would get them across it. Turns out that there is a gate on the side of the road, and as he got out of his truck to open it, the cows started across the street. He was yelling "NO", NO, not that way, come back". He and his dog had to run up the hill at the side of the road to get them turned around. It was all rather entertaining and amusing, As we were pulling away we could see them in our mirror. Not a sight you see everyday. We saw additional cows along side the road as we continued driving home, just standing there eating! 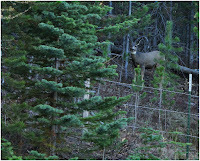 We also saw a number of deer. The trip home took us through Joseph, OR. A really cute town with lots of little stores and eateries. They had a number of statues as well. 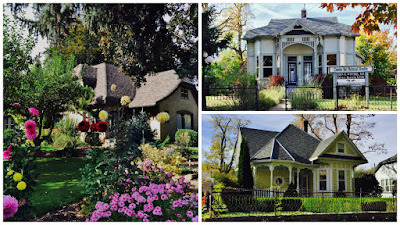 La Grande has a walking house tour, it is a two-mile walk and there is a brochure with a map to follow and a description of each of the 31 houses. 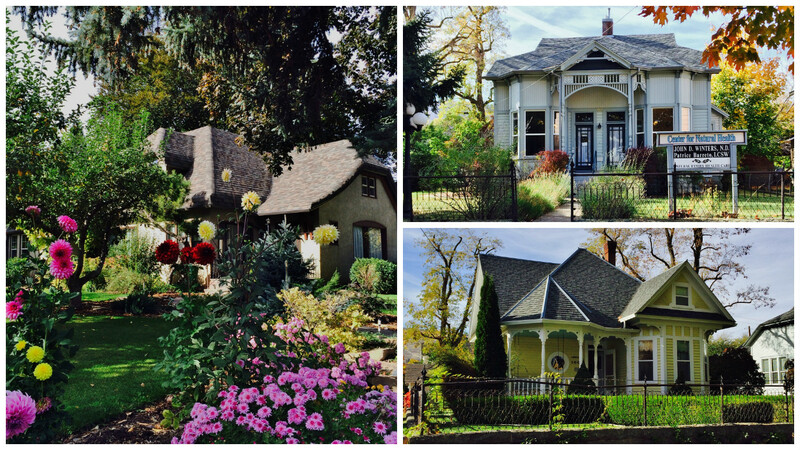 There is an assortment of styles of homes, from small to large and built from the late 1800's on. 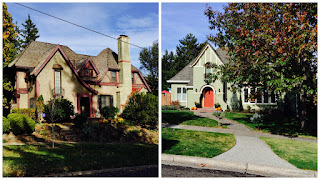 These two houses were built in the 1920's and reflect the Arts and Crafts movement. 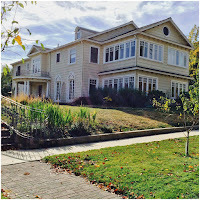 The Stange Manor, is a 7,800-square-foot home built in 1924 for the owner of the Mt. Emily Lumber Company. 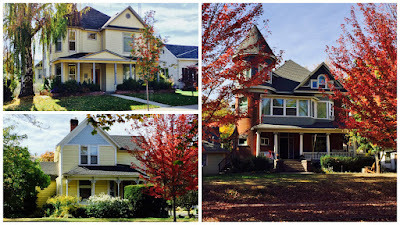 It has 4-bathrooms upstairs and a central vacuum system, all unusual for the era it was built. The English Tudor Cottage on the left, was built in 1924, it has beautiful gardens. Top right was built in 1890, although the two doors make it look like a duplex, it was not, the right door led to a music studio where lessons were given. Bottom right was built in 1902. 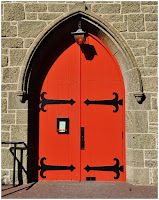 We passed a beautiful church, built in 1924 from volcanic tuff (a pyroclastic, consolidated rock composed of compacted volcanic ash) Nancy loved the door. Our stay in La Grande was extended by three days, as the next location was booked solid for the weekend due to a college football game. We used the time to work on some projects, pictures of our new drapes will show up in a future blog. The RV and car got a much needed bath and we took the RV in for an oil change (see the tip below). 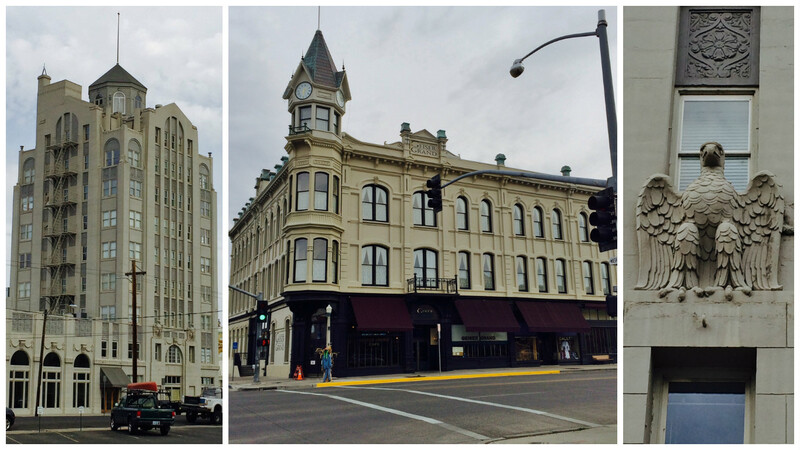 It also allowed us to explore Baker City a bit. 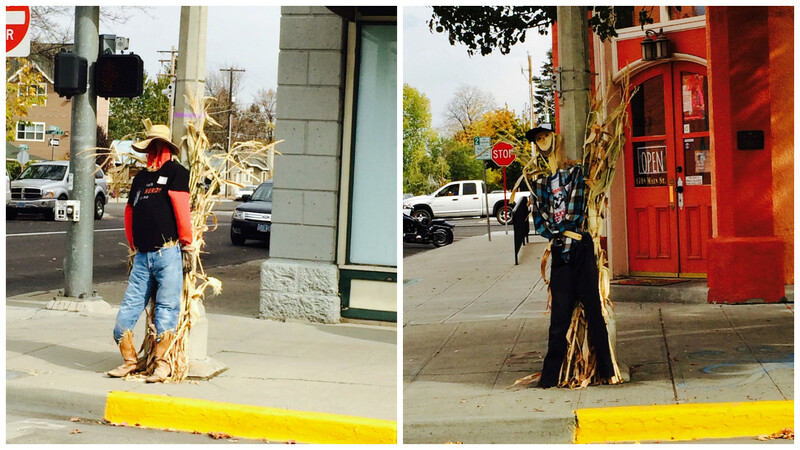 They have some beautiful old buildings and the streets are lined with scarecrows, which reminded us of Plymouth, MI. Plus, there is a store with a really great name! ~ When taking your RV in for an oil change ask if they will be lifting your RV or keeping it on the ground. With all other oil changes we have never had an issue with things inside moving or doors opening. This time we did. We secured everything for travel like we always do, but all of the cupboards over our sink and stove were open and some of the contents on the floor. The medicine cabinet door opened up and many things fell out including a hand mirror that was shattered on the floor.